Essential to Lexmark print system performance, Unison™ Toner's unique formulation consistently delivers outstanding image quality, ensures long-life print system reliability and promotes superior sustainability – all in an innovative shake-free print system. 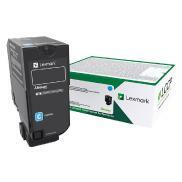 Lexmark Return Program cartridges are patented print cartridges sold at a discount in exchange for the customer’s agreement to the licence requirement that the cartridges will be used only once and returned only to Lexmark for remanufacturing and/or recycling. The Return Program cartridges are licensed for single use only and are designed to stop working after the delivery of a fixed amount of toner. A variable amount of toner will remain in the cartridge when replacement is required. In addition, the cartridge is designed to update the memory automatically in your printer to protect against the introduction of counterfeit and/or unauthorized third-party cartridges. If the customer does not accept these terms, replacement cartridges sold without these terms are available through www.lexmark.com. 최대 3,000 표준 페이지 ISO/IEC 19798에 따름.